MG unveiled the full range of styles for the UK MG3 at its Birmingham-based European Design Centre. The new 3 carries forward many of the styling cues first illustrated on the MG ZERO concept car, again designed at SAIC Motor’s European Design Centre. The UK studio has just undergone an additional investment and is now more than double its original size. It opened just three years ago in what was then a £5 million capital programme. The MG3 is designed to target young buyers, who are attracted by the level of personalisation available on the likes of the Citroen DS3, Fiat 500, MINI and recently launched Vauxhall Adam, but who are looking at more affordable B-segment models such as the Kia Rio, Skoda Fabia and Suzuki Swift. 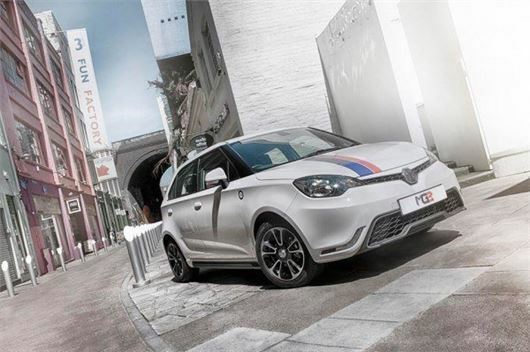 From launch, MG3 customers will be able to personalise both the exterior and interior. It will be offered with three trim levels, 10 colours and a range of at least 10 graphic packs. No prices were confirmed at the unveiling of the UK-specification model, but entry-level models are mooted to be coming in at less than £10,000. Depending on the model choice, exterior highlights include 16-inch Diamond cut alloy wheels, unique LED ‘hockey stick’ daytime running lights, sport-design bumper, side sill extensions, rear spoiler, sports-design rear valance, chrome exhaust finishers and MG insert headlamps. Full specifications and prices will be announced nearer to the public launch over MG3. Production will start in Longbridge later this year and it is anticipated that dealer demonstrators will be in showrooms by September. Who made the parts for the car ? A combination of MG (in UK and China) and MG's parent company, SAIC.